This bracelet is the purrfect match for cat charms. The double loop chains on this bracelet are designed to securely hold the charms. 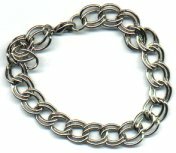 This bracelet is 8" long and has a sturdy clasp.